It was a unique experience for 800 lucky fans to be privileged to see Bob Dylan play a rare club gig at the Debaser in Stockholm. Dylan and his "Modern Times" touring band (Tony Garnier, Stu Kimball, Danny Freeman, George Recile, Donnie Herron) are currently touring Europe for a number of concerts in Sweden, Germany, Italy, Switzerland, and France. While the live audience is happy to see Dylan playing his Fender guitar again, those fans who did not have the chance to grab a ticket are being surprised by a number of good-quality bootleg audience recordings of the first shows. So far it seems that Dylan performs more new songs than usual after having released a new studio album. Apart from the always very loose selection of classics and live rarities ("Cat's In the Well", "Country Pie", "Tears of Rage"), this time Dylan's setlists also included the new "Rollin' and Tumblin'", "Thunder On the Mountain", "When the Deal Goes Down", "Nettie Moore", and "The Levee's Gonna Break". 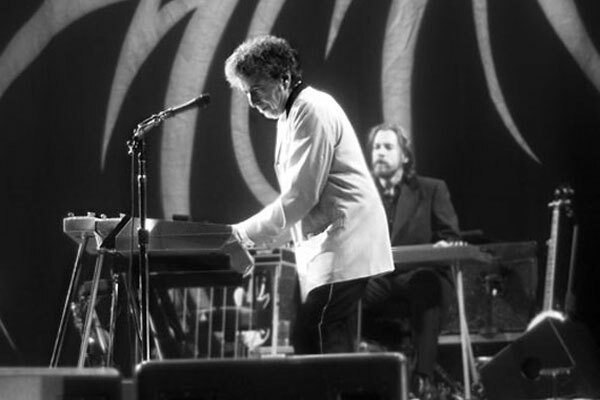 It's the simple fact that each of Dylan's live performances is different from the previous one, and the audience never really knows what to expect both in terms of the setlist and the way of interpretation of that wild selection from the Dylan repertoire, that still entertains the audience and keeps them coming back again. Just like a bottle of good red wine, the fascination with Bob Dylan grows every time you experience him - live or on record. In June 2007 Dylan and his Neverending Tour band will return to the US and Canada.